YP Media Player is audio and Video Player; currently in beta stage. 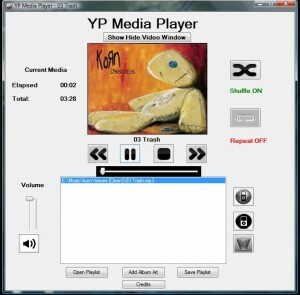 It supports audio and video playback, saving playlist, shuffle, repeat and other functions that media player should have. It is also faster. NOTE: The player is still in beta stage. Any suggestion and bug report will be appreciated. More features will be added continuously.